OK. I meant to finish the Sockapaloooza socks. But I got just a little distracted. #1 Son, you see, will be traveling to cold climes in a couple of weeks. He lost one of his gloves awhile back. But I can’t let him go off with cold hands, can I? So I started a new pair of gloves. You can see them towards the back of the basket. Same snowflake pattern, different colors. The yarn is Frogtree Alpaca sportweight. The colors are natural and undyed. Don’t worry, sock pal, it really doesn’t take that long to make a pair of gloves. I promise. 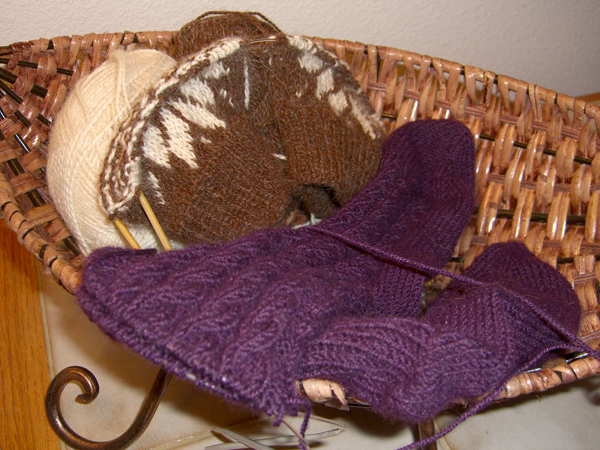 There’s still plenty of time left to finish the socks. And you can see from the picture that I’ve turned the cables on the socks for about the bazillionth time and I’m well up the ankles. About three more turns should do it. Then the ribbing. And done! In the other good news department: Kidd has been de-Borged (i.e. no more feeding tube), lost his accoutrement (i.e. a lovely blue Elizabethan collar), and is back to being a real kitty. He looks pretty sad, since one side was shaved when the feeding tube was put in and the rest of his fur is very skimpy due to stress and malnutrition. In fact, he sort of resembles a very large naked mole rat. But he’s eating like a pig and yesterday I caught him guarding “his” food dish (there are three that are available to anyone) from Phoebe (who could stand to lose a pound or two). He hasn’t done that for quite some time. I think he’s on the mend.